← ARC August: Niki’s Signing Up! The Overview: In a scarred and brutal future, The United Commonwealth teeters on the brink of all-out civil war. The rebel resistance plots against a government that rules with cruelty and cunning. Gifted student and Testing survivor Cia Vale vows to fight. But she can’t do it alone. This is the chance to lead that Cia has trained for – but who will follow? Plunging through layers of danger and deception, Cia must risk the lives of those she loves – and gamble on the loyalty of her lethal classmates. Graduation Day: was somewhere in between. I enjoyed it immensely and appreciated it as a trilogy ender, but it didn’t have the same X-factor as the second book. Although I will say I liked the ending better than a lot of other dystopians on the market. There was a really nice escalation of events and I felt the resolution was fulfilling and complex, fitting in well with the story as a whole. 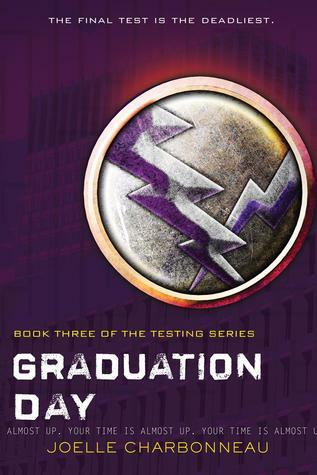 I also think I appreciated the characters a lot more in Graduation Day than in the previous two books. Cia had to do a lot of peer evaluation as she tried to figure out who she could trust, and I enjoyed trying to psychoanalyze them along with her. The best thing I can say is, by the end of the book I was genuinely worried about who would and wouldn’t make it to the end (gotta love those dystopians). Overall, I consider this dystopian well worth your time if you like the genre. To me it’s worth it for book 2 alone. I loved them enough to buy them all in hardcover and will definitely be rereading them.